I was hooked almost immediately. I enjoyed the casual nature of the gameplay and how it enabled me to utilize my creativity even when I was off the clock. One thing about my personal struggle with depression and anxiety is that I don’t like being left to my thoughts when I’m having a bad day. I’m constantly looking for little distractions so I don’t dwell on what I can’t control, and LN filled a tiny void that my other media couldn’t. Well, how did it do this? First of all, being on mobile, LN is far more accessible than my Playstation. It also doesn’t require the same amount of attention that is needed to sit down and read a couple chapters of a book. Being on mobile, I can open the app at any time from anywhere and just fumble with it for a few before going back to my day. As simplistic as the premise is, it turned into a mini escape in ways that I definitely didn’t expect—and ultimately it made me think about aspects of my personality that I otherwise hid for a significant portion of my young adulthood. Femininity and gaming are two things that should mesh without conflict, but often do. Not only present working in games but also just by being a gamer, simply being a woman is often used as ammunition to discredit my work or my interests—even without “acting like a girl” or being femme, although there’s certainly nothing wrong with either of those qualities. I admittedly have a lot of feminine interests, actually. I like makeup and clothes, a lot—but working adjacent to games and studying CGI before that, I started to hide that aspect of my personality as a defense mechanism. And I can’t tell you how much I regret doing that. It wasn’t until I was sitting back during a meeting break that a colleague looked over my shoulder and noted “Oh! 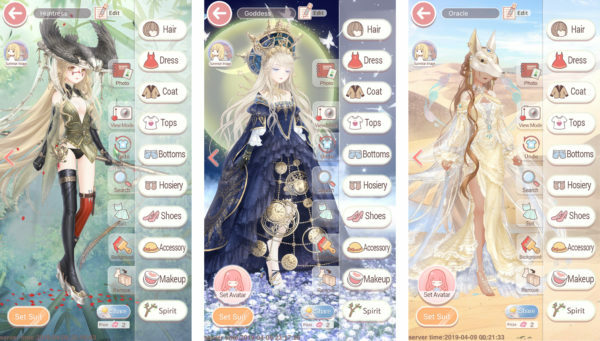 Love Nikki? I didn’t think you were into that sort of thing.” Initially, I was horrified! At that point, I had been successfully hiding my newfound admiration of LN for a few months, and suddenly my cover was blown. I was…drum roll…knee-deep in a fashion bonanza with a pink-haired protagonist and her cat companion. Heavens, how could I recover from such a blow? “That’s cool, Carolina’s really into it too,” he said, and that was that. Everything went back to normal. Even if it was for a fleeting moment, I had expressed a part of my personality that I often keep to myself: my femininity, and beyond that, my vulnerability. Aside from the dress-up aspect, there’s a bit of a negative stigma that comes with mobile games. I was honestly a little embarrassed to admit how much admiration I had developed for LN. Not only working adjacent to game development, but also as a pretty devoted gamer, I was nervous that I would be judged or have the rest of my gaming knowledge questioned (not that it isn’t already on a regular basis, but I’ll take a breather when I can). My fear of further providing that ammunition not only played into the overarching stigma, but it also hurt me in the process. Anytime that you feel the need to hide an aspect of your personality has the potential to be fairly damaging, no matter how big or small that aspect may be. But you know what? The “gatekeepers” are going to do what they do best regardless of my actions: seek to degrade and disavow players who they otherwise don’t view as worthy. Not only am I a woman, but I’m a feminist. Since I’m pretty sure that puts me on the blacklist, why not celebrate my interests instead of hide them? I can play Sekiro and Love Nikki, and I can also be proud of it! I shouldn’t be afraid to wear a little eyeliner or put on my favorite dress for a pitch—and I definitely shouldn’t be afraid to discuss my anxieties and how I used a dress-up game to cope with them. At the end of the day, there’s nothing wrong with mobile games or embracing your femininity, regardless of the status quo. And if there’s one message we always aim to achieve here at GeekGirlCon, it’s that the status quo is what you make it.